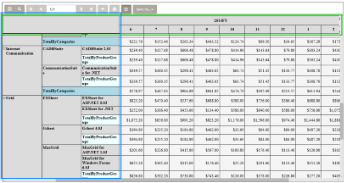 When you use a Table or a Tablix data region containing a large amount of data in an RDL report, the user must scroll to see all of the data. 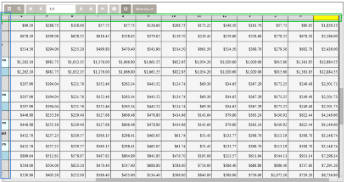 On scrolling the column or row headers out of sight, the data becomes difficult to understand. 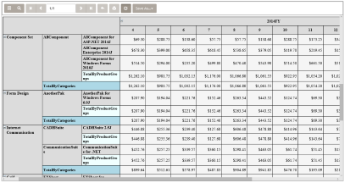 Note: The Frozen rows and columns feature is only available with RDL Reports. To alleviate this problem, we have added FrozenRows and FrozenColumns properties to the Table and Tablix data regions. The properties take effect in the HTML5 Viewer in Galley mode, and allow you to freeze headers so that they remain visible while scrolling through the data region. You can freeze as many rows or columns as you have headers in the data region. 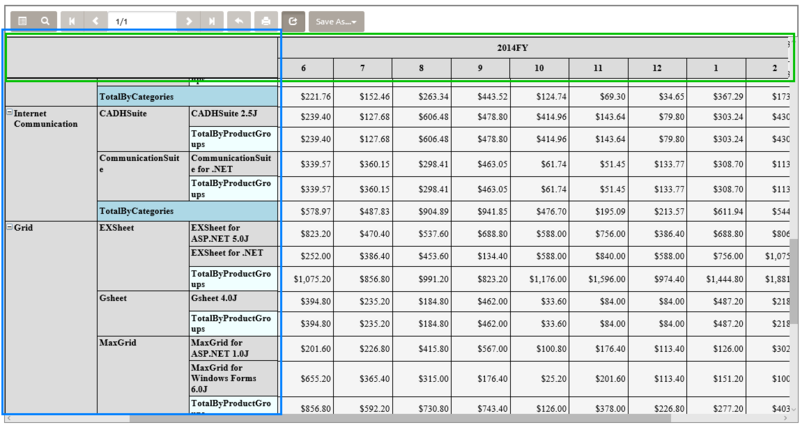 If your data stretches downward, set the FrozenRows property to a value to float the column headers when scrolling. 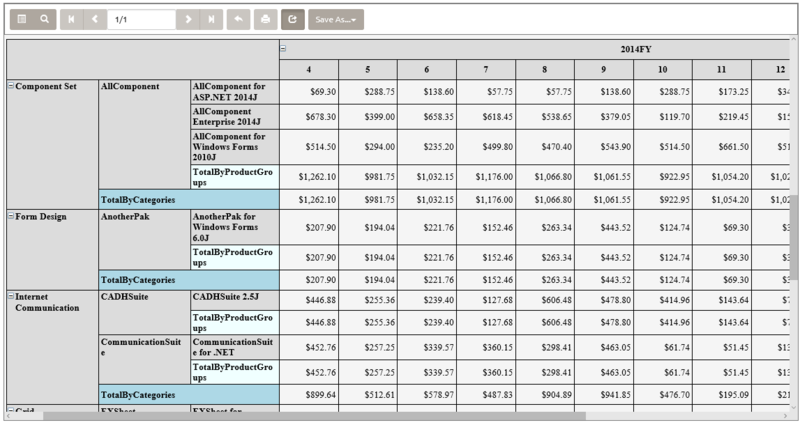 If your data stretches to the right, set the FrozenColumns property to a value to float the row headers when scrolling. If your data stretches both downward and to the right, set both FrozenRows and FrozenColumns properties. Here is an RDL report with a Tablix data region displayed in the HTML5 Viewer in Galley mode. 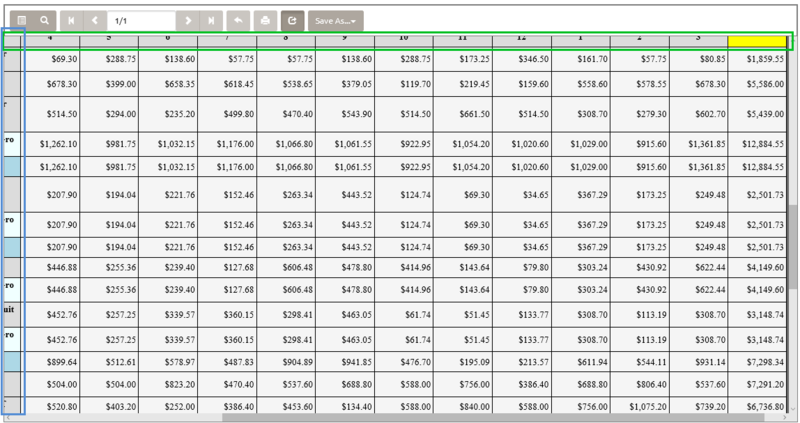 When you scroll to view more rows and columns of data, the row and column headers scroll out of view, like this. When you set FrozenColumns = 3 and FrozenRows = 2, the three row headers and two column headers float when the user scrolls through the data, like this. If any header cells that you want to freeze are merged, you should not set the FrozenRows or FrozenColumns property to a value that would split a merged cell. For example, in the image above, there is an empty merged cell at the top left corner. This cell prevents you from setting FrozenRows to a value less than 2, because it would split the merged cell. The same cell also prevents you from setting FrozenColumns to a value less than 3, because that would also split the merged cell.